One of these days I should add some slogans to the sides of those tanks. 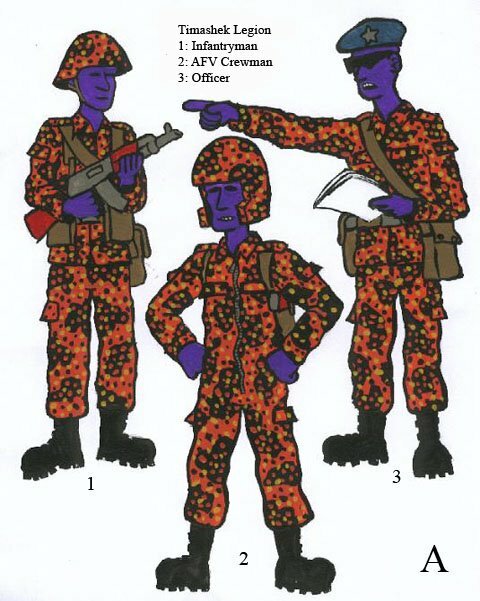 What I ordered yesterday was some more command (so I had a full compliment of platoon commanders - right now a SMG guy is just filling in), a 45mm AT gun, Tank Hunters (with an Anti-tank Rifle, panzerfaust, and antitank bomb dog…!? ), a BA-64 Armoured Car, and some tank crew (which I hope will fit into the tanks I’m planning to pick up from AGNM) all from Bolt Action (shipping is FREE worldwide until the end of April!). I also ordered a handful of more riflemen, from The Assault Group, to bring the average section strength up to 7 (When fielding the WHOLE company!). I think I’ll finish up the gun next… and some Pulp Adventure types… Then maybe some Germans… or Canadians… we shall see… Probably germans to fight this Commie Horde! Actually tomorrow night I'm starting off a Savage Worlds WW2 campaign. You'll be able to follow that action over at Savage Timmy's Playhouse. 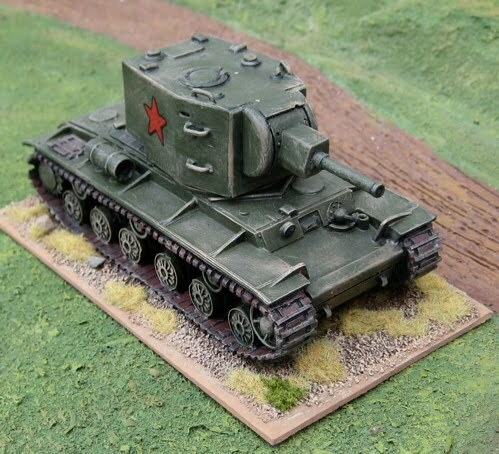 I also have a gun, a Gaz light truck, and a KV-2 to finish up. I would like to add some more equipment options that could be attached to the company for various scenarios... couple more tanks and/or assault guns, mortar(s), a lighter gun (I think the one I have is a 78mm - I'd like a 45mm, if anyone makes such a thing!?). I have to admit I’m a sucker for miniature character ripped off from movies, literature and other popular culture media… I have The Foundry’s ”B Team” (though I haven’t painted them yet)…. Tintin and Haddock (though the figure I used for Haddock wasn’t so much an “homage” as the others and required some conversion)… I have more than one pair of Holmes and Watson… Probably others that I can’t think of off the top of my head. As mentioned These are from Artizan Designs. While I’m at it… I’m not sure if I have a picture of Tintin and haddock together. 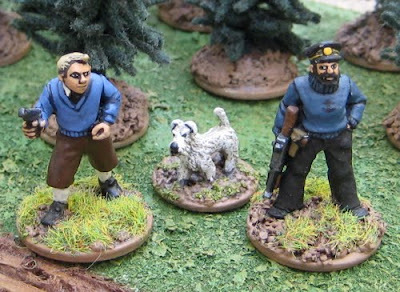 The Tintin figure is from Copplestone Castings and the Haddock figure is actually an LRDG figure form Artizan Designs, which I converted (I have to admit I had seen someone else using the same figure as Haddock but can’t remember where to give them their due credit… sorry…). A couple more Pulp Adventure types rolling off the workbench. 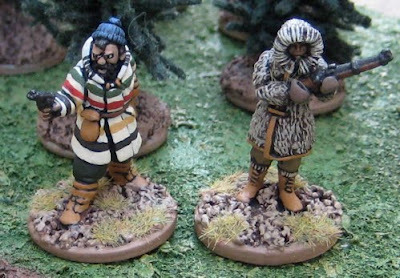 These chaps are from Pulp Figures “Yukon Peril” line. I’m thinking they might come in handy when I run Beyond the Mountains of Madness or Trail of Tsathogghua on Savage Saturday. This lot is all from Artizan Designs Thrilling Tales line. I’ve had them for a while, as with the ones above, and just finally getting around to painting them (because I’ve started running pulpy adventures again). I gotta say some of these are great figures and a load of fun to paint! I am exceptionally pleased with how the plaid skirt turned out. This is another I-Kore Void figure (currently available from Scotia Grendel). 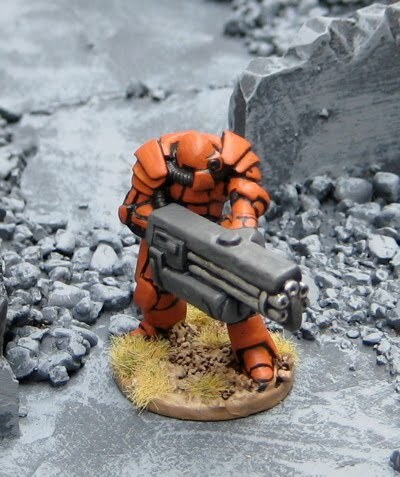 In the sort of Sci-fi universe I like to run the Imperial Space Marines are THE BIG STICK! You do not want to mess with them. If you have attracted enough attention from Imperial authorities you have EFFed it up BIG TIME and are going to pay in PAIN! Therefore I went with a bright orange power armour because they ARE the ULTIMATE badasses. They don’t give a f*ck if you know where they are… and, in fact, they want you to KNOW that they don’t give a f*ck if you know where they are! Some Pulp-ish Adventurers! 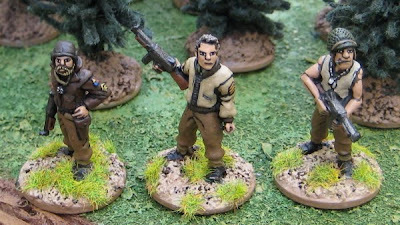 From left to right is a Bolshevik Heroine from Copplestone Castings, a German Zeppelin commander from Pulp Figures (who will be used as Freiherr Jöchim Von-und-zu Höllertal-Fürchtberg, retired German Army officer, in my new Savage Worlds Pulp/Chtulhu campaign – see more at Savage Timmy’s Playhouse), a “Trainee Agent” (also from Coppelstone), and a western type from Artizan Designs. 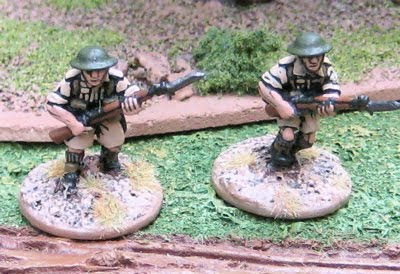 Two more Brits that I seemed to have missed when I did the last lot. I’ll also be working on some more 20s Pulp-Horror Adventure types… and some Fallshirmjägers (which just arrived!). I have been painting this past week – but not so much of little lead men. More on that in a moment. Most of my hobby time has been spent doing a bit of sorting and planning and a whole lot of re-basing. I’ve moved from the Victorian Horror and Pulp stuff into the WW2 stuff and have mostly re-based the Russians, Germans and British in North Africa. 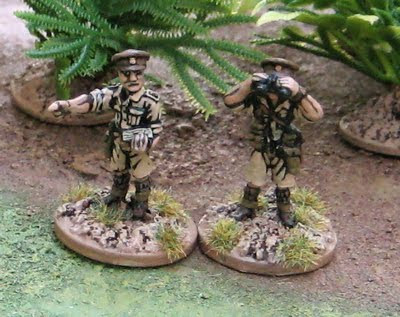 The Resistance/partisans are in the process of being re-based and I still have the British Commandos and Paras to do. I did start putting a bit of paint on some little lead men this evening. 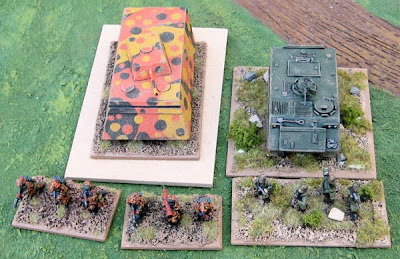 I’ve been thinking about the earlier half of the 20th Century and been contemplating both large scale (divisional actions using the HOTT variant) and skirmish games. 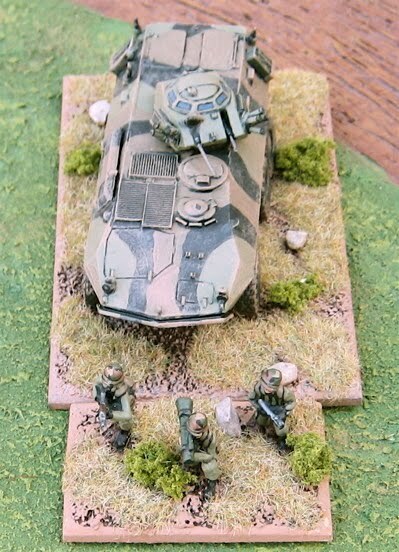 While re-baseing and plotting I decided to work on finishing off all the WW2 stuff I have in 28mm. The collection is largely static (despite the recent purchase of some Fallschirmjägers and some guys I plan to use as late war North West European Theatre of Operations Canadians). For the most part I have what I need and don’t plan on making any large additions to it in the near future – and there isn’t a monumental amount of it. I could probably finish it all off in a month (or so) if I stuck to it and it’s a great relief to say “Yep, I’m DONE all the stuff I have for the XXXXX period” - Oh, I’ll add to it SOME day… but I have no great compulsion (or money to) at the moment. Most of the painting I HAVE done this week was on a couple of paintings I was working on for my partner, Amanda. I used to paint a lot – as in pictures, not toys… though I’ve always done a lot of that too. I kind of stopped for about a decade, but over that last year or so I’ve been trying to get back into painting (pictures). For those that have been following for a while might remember me doing a uniform plate for the Timashek Legion. And those that follow my other blogs might have noticed the “critters on bikes” series I’ve been working on. Now I have to admit there’s a bit of a disconnect there for me. She says that she’s running the marathon to raise money for CF…? But I don’t really see how the two are related… You can donate money using the link on the blog (and, if you’re in Canada get a tax-deductible receipt) or you can buy a raffle ticket (if you’re a resident of Saskatchewan) and hopefully win one of the prizes… but none of that has anything to do with whether she finished the marathon or not…? Don’t get me wrong… I am nothing less than in awe of her ability to organize and train and, dang it, I think she’s actually going to be able to RUN the marathon! Anyway… what does all this have to do with me painting…? Well Amanda asked if I’d paint and donate a picture for her to include as one of the raffle prizes. And so I did. Two, actually… One for her to raffle off and the other for her to keep to remember what she accomplished. The paintings are called “Frosty Dreams of a Marathon in May – Day and Night”. The Day one she decided to use as a raffle prize, the Night one she is keeping for herself. They both picture her and her dog Ollie running in the deep cold of a Saskatchewan Winter – something I felt needed to be immortalized. I mean really, what kind of a nutcase takes up running in the middle of a frickin’ Saskatchewan winter – with an intensive training plan to prepare her for her first ever marathon at the end of may…?! That kind of nutcase happens to be my wife; Amanda Plante. If you happen to be in Saskatoon on Sunday May 30th, 2010, come on out and cheer her on (and our buddy CVT who’s coming from Edmonton to run with her)! Oh and – if you happen to be in Saskatchewan - maybe buy a couple of her raffle tickets! For the rest of you out in internetland, I’m sorry, but you’re out of luck – The Saskatchewan Liquor and Gaming Authority (yeah, booze and gambling – always a good mix) prohibits the advertising (er… ahem…) and sale of raffle tickets outside the province of Saskatohewan. While you’re there check out her insane training schedule – which she stuck to even on the -40°C days!? - and give her a cyber-high five (post a comment telling her how awesome she is! Because she doesn’t seem to believe me when I tell her…?!) – it’ll really make her day! Or RE-basing, I should say…. I’ve been thinking about re-basing my 20mm WW2, modern, and future war stuff for some time… the current impetus is my desire to try out Bruce McFarlane’s HOTT WW2 and Modern HOTT variants. More on that in a moment, though…. 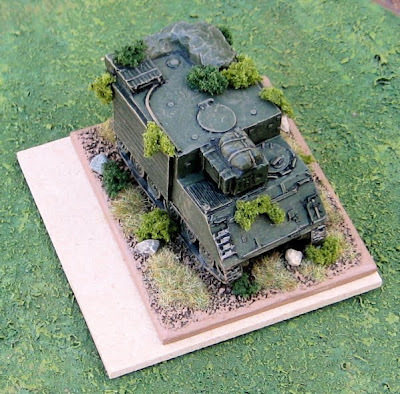 I’ve also been re-basing a bunch of 15mm WW2 stuff so they all have a common base frontage – mostly for the same reason. It hasn’t been so much work as only a few things that need rebasing. 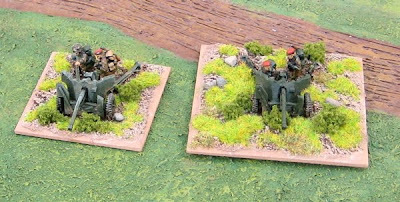 All the infantry and tanks were already on a 50mm frontage, some of the smaller guns and vehicles were on smaller bases and had to be redone. As for the 20mm stuff it’s, more or less, ALL going to have to be rebased. The question is what frontage to use…? I’m considering 60mm or 80mm. If using 60mm it would be the same frontage as 28mm DBA/HOTT. I could therefore use the same measuring sticks, terrain and game boards. 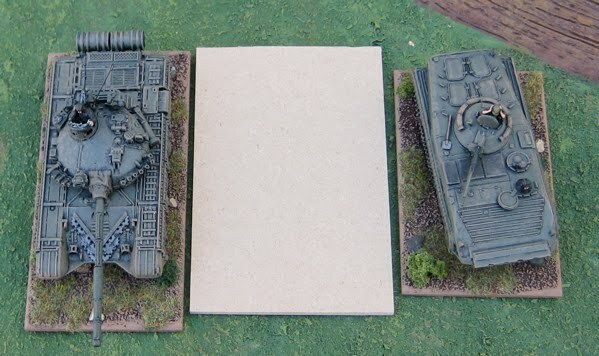 Also some of the Modern tanks and vehicles are currently on 2.5” bases and would only require shaving ~3mm off one side to make it 60mm (it’s not as difficult as it sounds - I’ve tried it). This would make for a bit less work and wastage of basing materials. 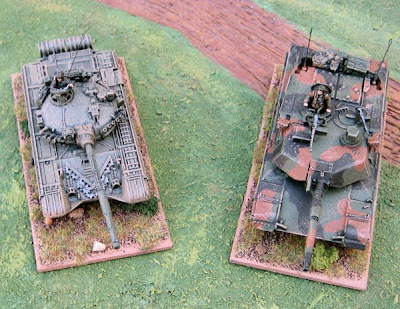 The downside of 60mm is that some of the big sci-fi tanks won’t really fit at all and some of the bigger WW2 and modern tanks and guns that do fit are still on proportionally much deeper bases. 80mm is double the “suggested” base widths as 15mm figures – so everything’s pretty easy to figure out. This frontage would require proportionally less deep bases – even for the big stuff. This is really one of the biggest issues for me. Having units on bases that are much deeper than they are wide just kind of looks funny to me and causes issues in the geometry of most games –especially in maneuvering and falling back and turning to face flanking enemy. 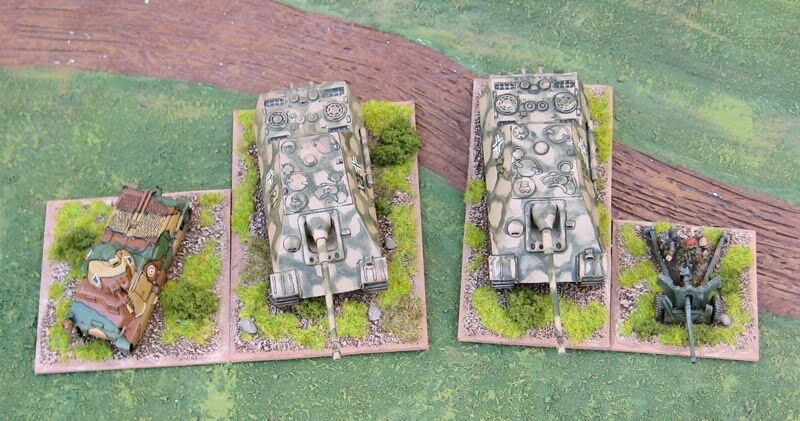 The infantry would be on 40mm deep base so that the total depth of 2 stands in column is the same as one base width, which makes things loads easier in terms of the geometry of the game. I did a few samples of each size for comparison and just to see what they look like…. From left to right; 50mm frontage (current), 60mm frontage, 80mm frontage. 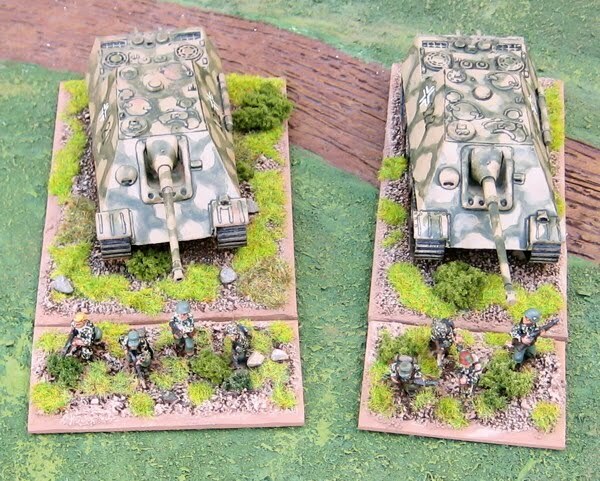 French Somua tank on 80mm (left) and 60mm (right) frontages. A lot of the WW2 tanks would fit on a 80mm square base – much reducing the number of units on bases deeper than they are wide. 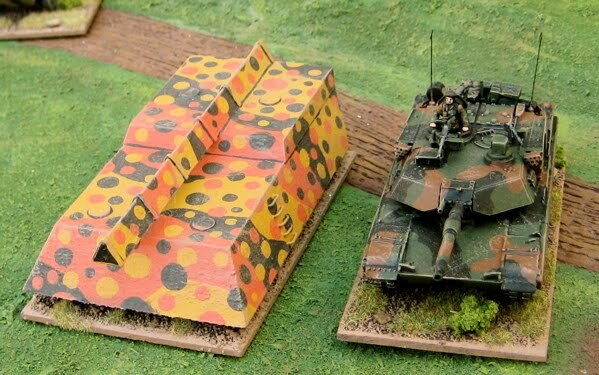 British 6pdr on 60mm (left) and 80mm (right) frontages. On the 60mm frontage the base is deeper than it is wide and I think the barrel STILL pokes out a bit. On the bigger base there is no barrel overhang – a consideration for storage stands that have overhanging barrels (or any overhanging parts) are harder to fit into storage together and more likely to be damaged… I suppose it’s also an issue on the tabletop when trying to line up stuff. The down side of the 80mm frontage here is it looks HUGE – the small gun and tean seem a little lost in the base… now this could be rectified with a bit more clever modeling – making these bases into mini dioramas. 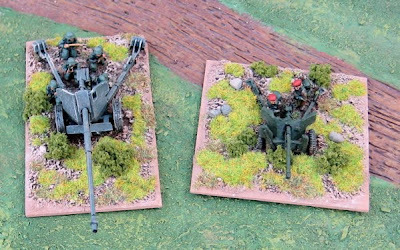 Perhaps some ammo boxes and extra crew could be added (of course that would require buying or manufacturing said sundry items… but..
German Pak 43/41 AT gun and crew on a 60mm frontage (left) and the British 6 pdr on the 80mm frontage (right). Even on an 80mm base I think the Pak 43/41 would still have some barrel overhand… unless I went with a REALLY deep base. 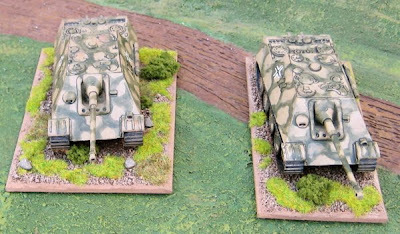 Jadgpanthers on 80mm (left) and 60mm (right) frontages. I think this is the largest of the WW2 tanks that I have in my arsenal currently. Same Jadgpanthers with others for comparison – on the left are Jagdpanther and Somua on 80mm frontages and on the right are a jadgpanther and a british 6pdr AT gun on 60mm frontages. The Jadgpanther on the 80mm frontage is on a base that’s only 1.5x base width deep, whereas the Jadgpanther on the 60mm wide base is over 2x the base width deep. 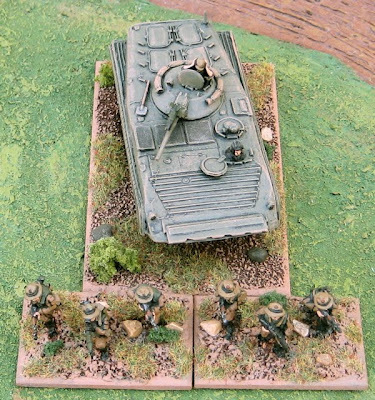 Tanks supporting infantry. The 80mm frontage units (on the left) end up being only 2x the base width total depth. The 60mm frontage units end up being almost 3x the base width. 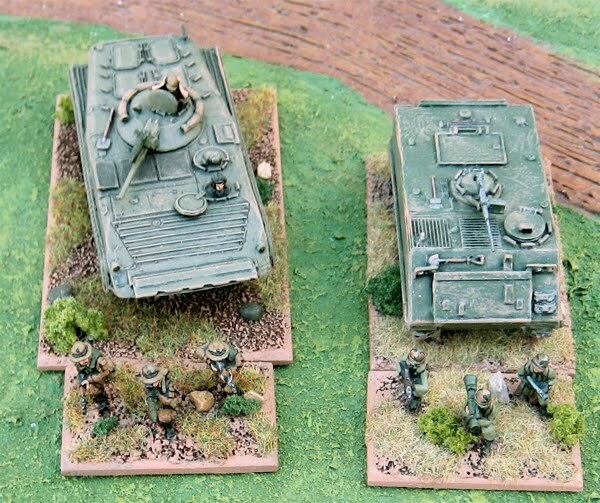 These are Cold War Canadians, form left to right; 50mm frontage (current), 60mm frontage, 80mm frontage. Same issues with the Canadians mounted in Grizzlies. More of the Future War stuff and modern stuff that has already been re-based to 80mm wide bases. 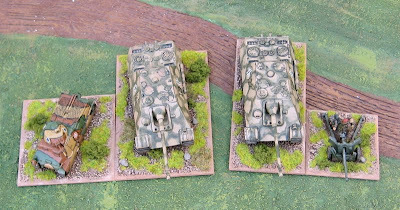 Well just in putting this post together I think I’ve pretty much convinced myself to go with the 80mm wide frontages… What I should have done is done a couple infantry stands with 4 and a couple with 5… that’s pretty much the only question remaining – how many infantry to put on the base…? …or Canadians…!? I got these chaps off Ebay and have no idea who manufactured them. If I had to guess I might say Battle Honours….? Also got a couple of bonus officers. What’s a squad without three officers? I’ve also been re-basing a bunch of 15mm WW2 stuff so they all have a common base frontage so I can try out Bruce McFarlane’s HOTT WW2 Variant. It hasen’t been so much work, its only a few things that need rebasing – all the infantry and tanks were already on a 50mm frontage, some of the smaller guns and vehicles were on smaller bases and had to be redone. I was originally planning to type up a long winded post for this morning explaining how I was going to pack it all in and sell off all my stuff… (it being April fools, and all) but the I decided I’ve got better things to do… Like paint more toys! !